Audiovector QR3 review | What Hi-Fi? With the Audiovector QR3s, you get what you pay for. No more, no less. The Danish hi-fi manufacturer has made a name for itself through its trademark upgradeable speakers – speakers that you can buy one year and upgrade the next, with better drivers, an improved crossover or even a superior cabinet. It’s quite the departure, then, for the company to introduce a speaker that’s an ‘as is’ design. There’s no upgrade path – just the QR3 floorstander we’re testing here, or its QR1 bookshelf sibling. The Audiovector QR3s are also considerably more affordable than the brand has ever been before, suggesting a focus on attracting a new market. But without their big USP to entice buyers in, can these smart floorstanders make the same impact? There’s no doubt the QR3s have had the same attention to detail in their build as the rest of Audiovector’s ranges. Available in a choice of walnut, black gloss or matt white, their cabinets are sturdy and well finished, with an integrated plinth that gives them a solid base to work from. The front baffle is too pretty to cover up with the included magnetic grilles, so we leave them off. The two 15cm drivers are encircled with brushed metal, while the gold leaf air-motion ribbon tweeter is housed behind an aluminium/tungsten fascia plate with rose gold mesh (which helps with sibilants, as well as looking nice). The QR3s are a 2.5-way design, with the lower of the two drivers augmenting low frequency output below 400Hz. They work best a little closer to the wall than our reference ATC speakers, so we move them back to within about 50cm, slightly toed in to our listening position. We start off with George Michael’s You Have Been Loved and are immediately struck by the QR3s’ clarity through the midrange. Vocals are crisp and upfront, and filled with a level of detail that immediately draws us in. 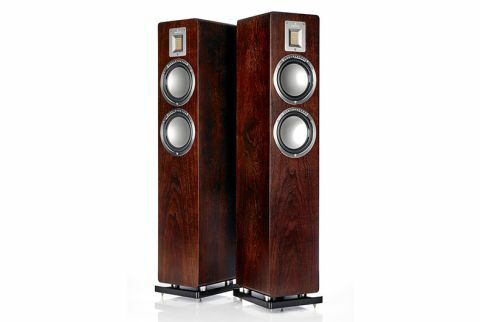 In fact, these speakers really shine from the midrange up – this is a song that trips up a lesser speaker in the upper register, but the treble here is clean and open, with no coarseness even at volume. The low end isn’t quite as strong, and struggles to compete with such a forward presentation. You’ll still get punch, particularly from the upper bass (which is taut and controlled), but it’s the real low weighty rumble you’ll miss out on here. Thankfully, the QR3s never sound fragile or unsure of themselves because of this – in fact, it’s a very confident presentation indeed - fast, rhythmic and with a real sense of drive. That’s great if you can take things down a notch too, but the QR3s only seem to have one speed, making mournful songs lose some of the fragile sentiment. We hear this elsewhere too – leading edges can be a little too punchy and the drive a touch too insistent, which ultimately can make the QR3s tiring over longer listens. Certainly, careful system matching will be required to ensure you don’t emphasise this with bright or equally forward-sounding partners. We switch to Jamie Cullum’s Fascinating Rhythm to see how the QR3s deal with dynamics, and once again hear the same energetic performance expressing Cullum’s frenetic piano playing with real attitude. It’s perhaps not the most refined presentation, but it is fun - and talented enough to keep a good handle on timing. It's reasonably controlled and cohesive, even when the piano is joined by Cullum’s jazz band. The QR3s are agile too, and jump to the rises and falls in volume and tempo without ever sounding flustered. We’d like them to be a touch subtler when things aren’t all go, but that isn’t in their character. These are speakers that like to be challenged. Their rather direct presentation means they aren’t the biggest sounding we’ve heard at this price but, thanks to their crystal-clear top end, you can push them hard. They have no problem filling our testing room, and the stereo image is seamless and precise too. Theirs is not going to be a balance for everyone, but there is something we find likeable about the QR3s. Entertaining and engaging, these are speakers that put drive and agility top of their hit list but fall short somewhat when it comes to subtlety. If this is a trade-off you’re happy with, and can pair them carefully with kit that’ll bring the best out of them, they’re well worth an audition.